The step up in quantitative easing by Bank of Japan led to a severe depreciation of the Japanese Yen. 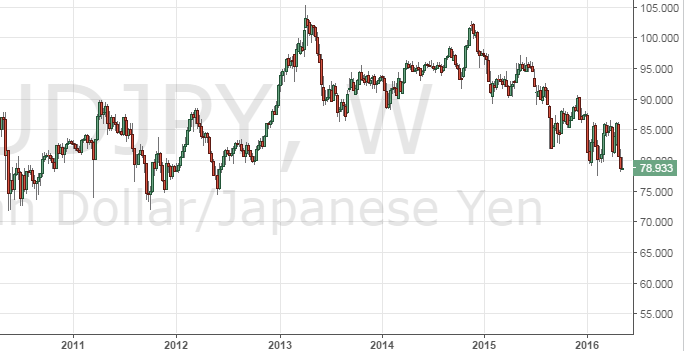 The fall in Yen resulted in the Australian Dollar to Japanese Yen Exchange rate (AUD JPY) reaching 102 in late 2014 which almost equaled the peak just before the GFC. If the run up in the AUD JPY was driven by a loose Japanese monetary policy. The fall over the last 18 months can be seen driven by a number of factors in Japan and Australia. On one hand, the decline in AUD to Yen can be partially attributed to increasing level of skepticism if will QE actually work to jump start Japan’s economy. It can also be argued that the key reason was the pressure on the Australian dollar from the fall in its key export commodity prices like Iron ore, coal and LNG. The decline in AUD JPY look to have bottomed in early 2016 but the key risk is the question when will Australian property bubble burst? We have highlighted some interesting trends that will be affected by the AUD vs JPY exchange rate. AUD Yen or simply 1 AUD to Yen has declined from 102 to 80 over the 18 months. This means that 1 Australian dollar could have bought at peak, 102 Japanese yen. Today 1 Australian dollar can only buy 85 yen at best. Inversely 1000 yen to AUD means the how much Australian dollar can 1000 yen buy. Using the 100 AUD to Japanese Yen rate example, 1000 yen can buy $100 Australian dollars. Market sentiment and expectations drive short term changes in FX markets. Long term economic relationships determine the trend and flow of funds from JPY to AUD and vice versa. Japan is Australia second largest trading partner after China. Australia has consistently ran a trade surplus with Japan which means that the value of our exports exceeded the valued of imports. A trade surplus relationship between Australia and Japan means trade provides a downward pressure on the Japanese Yen to AUD exchange rate. This is because for Japanese companies to buy Australian goods. They would have to sell Japanese yen and buy Australian dollars to pay for the imports. As the amount exported by Australia is significantly larger than the value of goods imported from Japan. Japanese companies have to sell more Japanese yen and buy Australian dollar to match the flow of goods. Major Australian export to Japan includes energy such as LNG (estm $14b) and Coal (estm $11.9). Range of base metals and bulk commodities from Copper (estm $1.6b) to Iron Ore ($8.4b). The trend of total trade value has been declining since 2011. This can be attributed to the decline in the price of these key commodites. The increase in volume of production and exports has not offset the severity of the decline in prices. As commodity prices slowly recover with production volumes stable. We expect this to stabilize and gradually to trend up. This is not including the ramp up of the LNG exports which we expect to support the strengthening of the Australian dollar in the medium term. Promisingly, the trend in exports is shifting to soft commodities where it is our largest markets for beef, fish and other soft food goods. Like the United States, Japanese consumers also love Australian beef (estm $1.6b). Japan is Australia 3rd largest source of imports in goods. The range of goods focus primarily on passenger vehicles and refined petroleum. Strong trade relationship improved further through the implementation of the Japan Australia Economic Partnership Agreement. 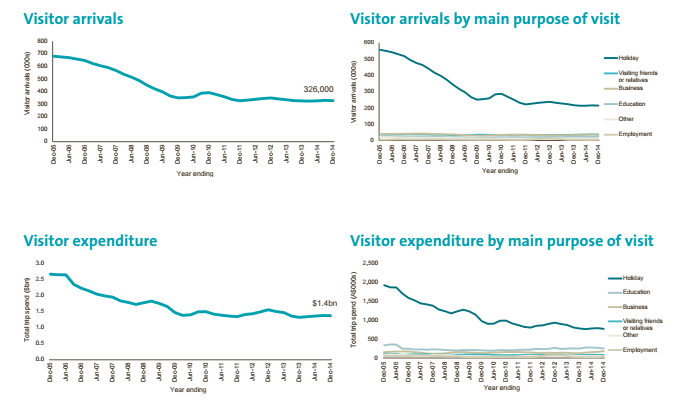 Tourism Australia keeps a nice historical trend of Japanese tourism in Australia. China became the largest tourism export market for Australia while the trend for Japan is undeniably down. Recent signs show that this has stabilized. The strong Japanese Yen to AUD will further boost Japanese tourism figures going forward. This is a positive trend that has more room to run. As the data in the chart covered to December 2014. We expect real time Japanese tourism spend in Australia to be more positive. We forecast that the AUD to JPY exchange to level at where it is today with an upside bias in the medium term. We expect the AUD to Yen to appreciate overtime but the trend will take time to form. The forecast is based on our bullish view Australia and bearish view on the Japanese economy. Similar to Eur to Aud, we expect the Australian dollar to appreciate against the JPY in the long run. Commodity prices started a silent recovery in 2016 which we expect to continue going forward. The recovery in prices will be a boost to net trade numbers as our imports from Japan has been steady over the last decade. Along with trade, differences in interest rates also set the flow of funds between economies and the supply and demand of currencies. Australian cash rate, set by the Reserve Bank of Australia reached record low at 2.00%. 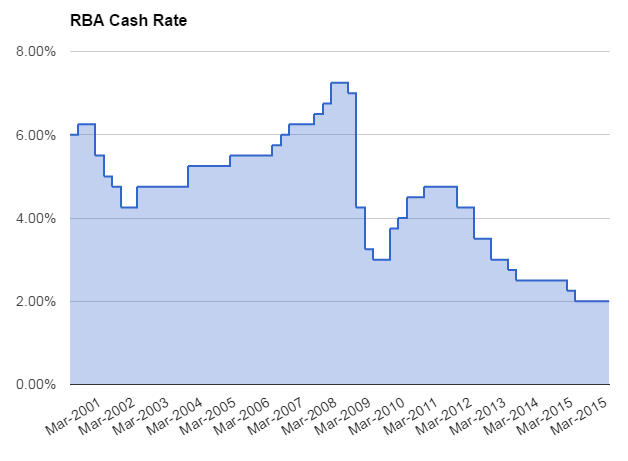 Japanese cash rate set by BOJ as been near zero for almost 2 decades. We consider the Australian interest rate to have bottomed with next move to be a interest rate hike. The market has not priced this this possibility but we expect once this view reaches broader agreement, the AUD Yen exchange rate will move up from today’s level. Carry trade is when investors buys a higher yielding and sells the lower yield currency. The cash rate ultimately sets the floor rate or the lowest rate from investing in cash in each currency. Carry trade was a popular FX trading strategy before the financial crises when global interest rates where higher. Example of AUD to Yen carry trade: Borrow and convert 10000 yen to AUD. Once the money is transferred from Yen to Aus dollar, use the proceeds to purchase Australian assets that provide a cash rate or cash rate plus asset class premium return. The cost of borrowing yen is offset by the return in AUD investments. Over time, the return in Australian dollars minus the cost of borrowing yen is the profit. Converting proceeds back from AUD to Japanese Yen closes ehe position. The critical assumption is that the exchange rate is constant or not volatile that it wipes away the profit. The ups and downs of AUD vs Yen can determine the overall profitability of the trade. The AUD JPY rate was a popular carry trade strategy as the large interest rate differentials provided a decent buffer to adverse exchange movements. The low interest environment today does not support this strategy. However it can provide a nice tailwind on direction bets on the currency. Related: See our Analysis of AUD to NZD and AUD to EURO analysis. Here is a list of risks that could derail our currency forecast. We have categorized the source of risk by currency. Stronger than expected strengthening in Japanese yen could exacerbate another leg down in the AUD to JPY rate. The market is already skeptical of further easing measures by Bank of Japan. FX rates over the long run are mean reverting. Exchange rates represent a relative price of currencies. No exchange rate goes up or down forever. Eventually, the fundamental would push for trends to reverse. A period of weakness in Yen could be followed by a period of strength. Global equity markets has been weak. S&P 500 index has gone nowhere in the last 18 months. European equities like the DAX Index are in a bear market. Any large sell off in the equity markets will result in flow of funds back to Japan which is a driver of a stronger yen. From a trade perspective, Japan ran large trade deficits post the Fukushima accident as LNP imports replaced nuclear energy. Nuclear plants in Japan are coming back online and the trend is reversing as we speak. Key risks of the exchange rate missing our forecast of a stable and uptrending AUD to Yen rate is the weakness in China and deflation of house prices in Australia. The future of the Australia dollar is based on the economic growth of its largest trading partner, China. It is no secret that China is experiencing a major economic slowdown. The fall in commodity prices was primarily due to slower than expected Chinese demand. A continuation of weak Chinese demand would put additional pressure on the dollar. It would make recently rally in the AUD a dead cat bounce instead of a trend reversal. Although it is not our base case. We are cautious on China. The weakness has flowed through the markets and it looks the worse to be behind us. However the market has a tendency of giving us surprises. Also a key risk for the Australian dollar is the fall in house prices. There are signs that Sydney house prices have peaked. Melbourne is experiencing a glut in apartment supply. A weakening housing sector would allow the Reserve Bank greater room to maneuver in cutting rates. We think in the next 12 – 18 month the decline in Australia housing price could pose the greatest risk to further rally in the dollar. The Australian banks being the primary financier of the boom profess cautiousness in lending, it is nonetheless a concentrated exposure to Australian residential real estate sector. In the extreme case where a prolong slump hits bank capital buffers. Potential Government support for the banks is a material risk for the Australia dollar as residential lending exposure is transferred from the private sector the public sector. This is the worst case scenario and a large negative to our AUD to Yen forecast.